Argentine President Mauricio Macri during a welcoming ceremony at the Planalto Presidential Palace, Brasilia, Brazil, Feb. 7, 2017 (AP photo by Eraldo Peres). 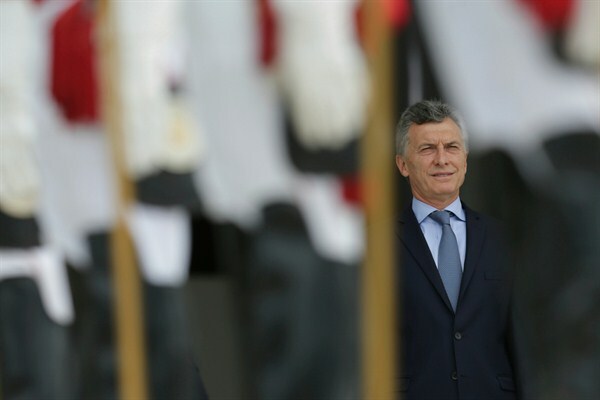 In a decree late last month, Argentina’s president, Mauricio Macri, announced new immigration rules that risk repudiating the country’s history and could presage a painful break with its neighbors. The policy changes themselves are relatively minor, explicitly prohibiting the entry of any foreign national with past involvement in drug trafficking, money laundering, human trafficking and several other activities associated with organized crime. The new measures also expedite the deportation of all foreign-born residents implicated in similar crimes, whether these were committed in Argentina or in other countries. While the threshold for implication necessary for deportation remains uncertain, it can be triggered without a criminal conviction.